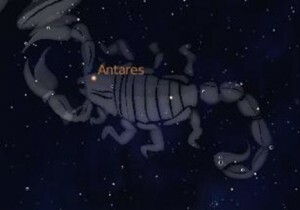 Though not as distinctive as Orion’s Belt or the Southern Cross, it’s fairly easy to spot the curved tail of the constellation Scorpius—and then follow the line of stars making up the imaginary scorpion, although the claws are a stretch.It’s a useful sign post when looking to name that star—and being a zodiac constellation it helps to locate the ecliptic and the other zodiac constellations. Libra is next along (west) from its claws and Sagittarius next along (east) from it’s tail. 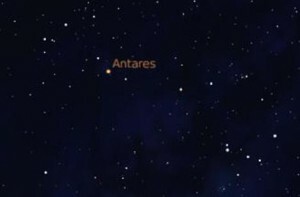 Antares is a huge red supergiant star (about 700 times as big as the sun) and easy to spot at the head of the scorpion.